Treatment with metoclopramide for longer than 12 weeks should be avoided in all but rare cases where therapeutic benefit is thought to outweigh the risk of developing tardive dyskinesia. Metoclopramide Oral Solution, USP is a clear, butterscotch flavor, sugar-free liquid for oral administration. Inactive Ingredients: Methylparaben, Citric Acid Anhydrous, FD&C Yellow #6, Sorbitol Solution, Glycerin, Butterscotch Flavor and Purified Water. Metoclopramide increases the tone and amplitude of gastric (especially antral) contractions, relaxes the pyloric sphincter and duodenal bulb, and increases peristalsis of the duodenum, and jejunum resulting in accelerated gastric emptying and intestinal transit. It increases the resting tone of the lower esophageal sphincter. It has little, if any, effect on the motility of the colon or gallbladder. The antiemetic properties of metoclopramide appear to be a result of its antagonism of central and peripheral dopamine receptors. Dopamine produces nausea and vomiting by stimulation of the medullary chemoreceptor trigger zone (CTZ), and metoclopramide blocks stimulation of the CTZ by agents like L-dopa or apomorphine, which are known to increase dopamine levels or to possess dopamine-like effects. Metoclopramide also abolishes the slowing of gastric emptying caused by apomorphine. Metoclopramide is rapidly and well absorbed. Relative to intravenous dose of 20 mg, the absolute oral bioavailability of metoclopramide is 80% ± 15.5% as demonstrated in a crossover study of 18 subjects. Peak plasma concentrations occur at about 1 to 2 hours after a single oral dose. Similar time to peak is observed after individual doses at steady state. In a single dose study of 12 subjects, the area under the drug concentration-time curve increases linearly with doses from 20 to 100 mg. Peak concentrations increase linearly with dose, time to peak concentrations remains the same; whole body clearance is unchanged; and the elimination rate remains the same. The average elimination half-life in individuals with normal renal function is 5 to 6 hours. Linear kinetic processes adequately describe the absorption and elimination of metoclopramide. In an open-label study, six pediatric patients (age range, 3.5 weeks to 5.4 months) with GER received metoclopramide 0.15 mg/kg oral solution every 6 hours for 10 doses. The mean peak plasma concentration of metoclopramide after the tenth dose was 2-fold (56.8 mcg/L) higher compared to that observed after the first dose (29 mcg/L) indicating drug accumulation with repeated dosing. After the tenth dose, the mean time to reach peak concentrations (2.2 hr), half-life (4.1 hr), clearance (0.67 L/h/kg), and volume of distribution (4.4 L/kg) of metoclopramide were similar to those observed after the first dose. In the youngest patient (age, 3.5 weeks), metoclopramide half-life after the first and the tenth dose (23.1 and 10.3 hr, respectively) was significantly longer compared to other infants due to reduced clearance. This may be attributed to immature hepatic and renal systems at birth. Single intravenous doses of metoclopramide 0.22 to 0.46 mg/kg (mean, 0.35 mg/kg) were administered over 5 minutes to 9 pediatric cancer patients receiving chemotherapy (mean age, 11.7 years; range, 7 to 14 yr) for prophylaxis of cytotoxic-induced vomiting. The metoclopramide plasma concentrations extrapolated to time zero ranged from 65 to 395 mcg/L (mean, 152 mcg/L). The mean elimination half-life, clearance, and volume of distribution of metoclopramide were 4.4 hr (range, 1.7 to 8.3 hr), 0.56 L/h/kg (range, 0.12 to 1.20 L/h/kg), and 3 L/kg (range, 1 to 4.8 L/kg), respectively. In another study, nine pediatric cancer patients (age range, 1 to 9 yr) received 4 to 5 intravenous infusions (over 30 minutes) of metoclopramide at a dose of 2 mg/kg to control emesis. After the last dose, the peak serum concentrations of metoclopramide ranged from 1060 to 5680 mcg/L. The mean elimination half-life, clearance, and volume of distribution of metoclopramide were 4.5 hr (range, 2 to 12.5 hr), 0.37 L/h/kg (range, 0.1 to 1.24 L/h/kg), and 1.93 L/kg (range, 0.95 to 5.5 L/kg), respectively. The use of Metoclopramide Oral Solution is recommended for adults only. Therapy should not exceed 12 weeks in duration. Metoclopramide Oral Solution is indicated as short-term (4 to 12 weeks) therapy for adults with symptomatic, documented gastroesophageal reflux who fail to respond to conventional therapy. The principal effect of metoclopramide is on symptoms of postprandial and daytime heartburn with less observed effect on nocturnal symptoms. If symptoms are confined to particular situations, such as following the evening meal, use of metoclopramide as single doses prior to the provocative situation should be considered, rather than using the drug throughout the day. Healing of esophageal ulcers and erosions has been endoscopically demonstrated at the end of 12-week trial using doses of 15 mg q.i.d. As there is no documented correlation between symptoms and healing of esophageal lesions, patients with documented lesions should be monitored endoscopically. Metoclopramide is indicated for the relief of symptoms associated with acute and recurrent diabetic gastric stasis. The usual manifestations of delayed gastric emptying (e.g., nausea, vomiting, heartburn, persistent fullness after meals and anorexia) appear to respond to metoclopramide within different time intervals. Significant relief of nausea occurs early and continues to improve over a three-week period. Relief of vomiting and anorexia may precede the relief of abdominal fullness by one week or more. Metoclopramide should not be used in epileptics or patients receiving other drugs, which are likely to cause extrapyramidal reactions, since the frequency and severity of seizures or extrapyramidal reactions may be increased. Extrapyramidal symptoms, manifested primarily as acute dystonic reactions, occur in approximately 1 in 500 patients treated with the usual adult dosages of 30 to 40 mg/day of metoclopramide. These usually are seen during the first 24 to 48 hours of treatment with metoclopramide, occur more frequently in pediatric patients and adult patients less than 30 years of age and are even more frequent at the higher doses. These symptoms may include involuntary movements of limbs and facial grimacing, torticollis, oculogyric crisis, rhythmic protrusion of tongue, bulbar type of speech, trismus, or dystonic reactions resembling tetanus. Rarely, dystonic reactions may present as stridor and dyspnea, possibly due to laryngospasm. If these symptoms should occur, inject 50 mg Benadryl® (diphenhydramine hydrochloride) intramuscularly, and they usually will subside. Cogentin® (benzatropine mesylate), 1 to 2 mg intramuscularly, may also be used to reverse these reactions. Parkinsonian-like symptoms have occurred, more commonly within the first 6 months after beginning treatment with metoclopramide, but occasionally after longer periods. These symptoms generally subside within 2 to 3 months following discontinuance of metoclopramide. Patients with preexisting Parkinson's disease should be given metoclopramide cautiously, if at all, since such patients may experience exacerbation of parkinsonian symptoms when taking metoclopramide. Treatment with metoclopramide can cause tardive dyskinesia (TD), a potentially irreversible and disfiguring disorder characterized by involuntary movements of the face, tongue, or extremities. The risk of developing tardive dyskinesia increases with the duration of treatment and the total cumulative dose. An analysis of utilization patterns showed that about 20% of patients who used metoclopramide took it for longer than 12 weeks. Treatment with metoclopramide for longer than the recommended 12 weeks should be avoided in all but rare cases where therapeutic benefit is thought to outweigh the risk of developing TD. Because metoclopramide produces a transient increase in plasma aldosterone, certain patients, especially those with cirrhosis or congestive heart failure, may be at risk of developing fluid retention and volume overload. If these side effects occur at anytime during metoclopramide therapy, the drug should be discontinued. Adverse reactions, especially those involving the nervous system, may occur after stopping the use of metoclopramide. A small number of patients may experience a withdrawal period after stopping metoclopramide that could include dizziness, nervousness, and/or headaches. The use of metoclopramide oral solution is recommended for adults only. Metoclopramide may impair the mental and/or physical abilities required for the performance of hazardous tasks such as operating machinery or driving a motor vehicle. The ambulatory patient should be cautioned accordingly. Patients should be informed of the availability of a Medication Guide, and they should be instructed to read the Medication Guide prior to taking Metoclopramide Oral Solution. Patients should be instructed to take Metoclopramide Oral Solution only as prescribed. Gastroparesis (gastric stasis) may be responsible for poor diabetic control in some patients. Exogenously administered insulin may begin to act before food has left the stomach and lead to hypoglycemia. Because the action of metoclopramide will influence the delivery of food to intestines and thus the rate of absorption, insulin dosage or timing of dosage may require adjustment. Reproduction studies performed in rats, mice, and rabbits by the I.V., I.M., S.C., and oral routes at maximum levels ranging from 12 to 250 times the human dose have demonstrated no impairment of fertility or significant harm to the fetus due to metoclopramide. There are, however, no adequate and well-controlled studies in pregnant women. Because animal reproduction studies are not always predictive of human response, this drug should be used during pregnancy only if clearly needed. Safety and effectiveness in pediatric patients have not been established (see OVERDOSAGE). Care should be exercised in administering metoclopramide to neonates since prolonged clearance may produce excessive serum concentrations (see CLINICAL PHARMACOLOGY–Pharmacokinetics). In addition, neonates have reduced levels of NADH-cytochrome b5 reductase, which, in combination with the aforementioned pharmacokinetic factors, make neonates more susceptible to methemoglobinemia (see OVERDOSAGE). The risk of developing parkinsonian-like side effects increases with ascending dose. Geriatric patients should receive the lowest dose of metoclopramide that is effective. If parkinsonian-like symptoms develop in a geriatric patient receiving metoclopramide, metoclopramide should generally be discontinued before initiating any specific antiparkinsonian agents (see WARNINGS and DOSAGE AND ADMINISTRATION - For the Relief of Symptomatic Gastroesophageal Reflux). Sedation has been reported in metoclopramide users. Sedation may cause confusion and manifest as over-sedation in the elderly (see CLINICAL PHARMACOLOGY, PRECAUTIONS - information for patients and ADVERSE REACTIONS - CNS Effects). Metoclopramide is known to be substantially excreted by the kidney, and the risk of toxic reactions to this drug may be greater in patients with impaired renal function (see DOSAGE AND ADMINISTRATION-USE IN PATIENTS WITH RENAL OR HEPATIC IMPAIRMENT). For these reasons, dose selection for an elderly patient should be cautious, usually starting at the low end of the dosing range, reflecting the greater frequency of decreased renal functions, concomitant disease, or other drug therapy in the elderly (see DOSAGE AND ADMINISTRATION – For the Relief of Symptomatic Gastroesophageal Reflux and USE IN PATIENTS WITH RENAL OR HEPATIC IMPAIRMENT). Restlessness, drowsiness, fatigue, and lassitude occur in approximately 10% of patients receiving the most commonly prescribed dosage of 10 mg q.i.d. (see PRECAUTIONS). Insomnia, headache, confusion, dizziness, or mental depression with suicidal ideation (see WARNINGS) occur less frequently. The incidence of drowsiness is greater at higher doses. There are isolated reports of convulsive seizures without clearcut relationship to metoclopramide. Rarely, hallucinations have been reported. Acute dystonic reactions, the most common type of EPS associated with metoclopramide, occur in approximately 0.2% of patients (1 in 500) treated with 30 to 40 mg of metoclopramide per day. Symptoms include involuntary movements of limbs, facial grimacing, torticollis, oculogyric crisis, rhythmic protrusion of tongue, bulbar type of speech, trismus, opisthotonus (tetanus-like reactions) and rarely, stridor and dyspnea possibly due to laryngospasm; ordinarily these symptoms are readily reversed by diphenhydramine (see WARNINGS). Rare occurrences of neuroleptic malignant syndrome (NMS) have been reported. This potentially fatal syndrome is comprised of the symptom complex of hyperthermia, altered consciousness, muscular rigidity, and autonomic dysfunction (see WARNINGS). Hypotension, hypertension, supraventricular tachycardia, bradycardia, fluid retention, acute congestive heart failure, and possible AV block (see CONTRAINDICATIONS and PRECAUTIONS). A few cases of neutropenia, leukopenia, or agranulocytosis, generally without clearcut relationship to metoclopramide. Methemoglobinemia, in adults and especially with overdosage in neonates (see OVERDOSAGE). A few cases of rash, urticaria, or bronchospasm, especially in patients with a history of asthma. Rarely angioneurotic edema, including glossal or laryngeal edema. Unintentional overdose due to misadministration has been reported in infants and children with the use of metoclopramide oral solution. While there was no consistent pattern to the reports associated with these overdoses, events included seizures, extrapyramidal reactions, and lethargy. Methemoglobinemia has occurred in premature and full-term neonates who were given overdoses of metoclopramide (1 to 4 mg/kg/day orally, intramuscularly or intravenously for 1 to 3 or more days). Methemoglobinemia can be reversed by the intravenous administration of methylene blue. However, methylene blue may cause hemolytic anemia in patients with G6PD deficiency, which may be fatal (see PRECAUTIONS - Other Special Populations). Store at controlled room temperature, between 20 °C and 25 °C (68 ° to 77 °F) (see USP). Benadryl® is a registered trademark of Pfizer Inc.
Read the Medication Guide that comes with Metoclopramide Oral Solution, USP before you start taking it and each time you get a refill. There may be new information. If you take another product that contains Metoclopramide (such as REGLAN tablets, REGLAN ODT, or REGLAN injection), you should read the Medication Guide that comes with that product. Some of the information may be different. This Medication Guide does not take the place of talking to your doctor about your medical condition or your treatment. Abnormal muscle movements called Tardive Dyskinesia (TD). These movements happen mostly in the face muscles. You can not control these movements. They may not go away even after stopping Metoclopramide. There is no treatment for Tardive Dyskinesia but symptoms may lessen or go away over time after you stop taking Metoclopramide. See the section "What are the possible side effects of Metoclopramide?" In adults for 4 to 12 weeks to relieve heartburn symptoms with gastroesophageal reflux disease (GERD) when certain other treatments do not work. Metoclopramide relieves daytime heartburn and heartburn after meals. It also helps ulcers in the esophagus to heal. To relieve symptoms of slow stomach emptying in people with diabetes. Metoclopramide helps treat symptoms such as nausea, vomiting, heartburn, feeling full long after a meal, and loss of appetite. All these symptoms do not get better at the same time. It is not known if Metoclopramide is safe and works in children. Who should not take Metoclopramide? Are allergic to Metoclopramide or anything in it. See the end of this Medication Guide for a list of the ingredients in Metoclopramide. What should I tell my doctor before taking Metoclopramide? You are pregnant or plan to become pregnant. It is not known if Metoclopramide will harm your unborn baby. You are breast-feeding. Metoclopramide can pass into breast milk and may harm your baby. Talk with your doctor about the best way to feed your baby if you take Metoclopramide. Tell your doctor about all of the medicines you take, including prescription and nonprescription medicines, vitamins, and herbal supplements. Metoclopramide and some other medicines may interact with each other and may not work as well, or cause possible side effects. Do not start any new medicines while taking Metoclopramide until you talk with your doctor. Another medicine that contains Metoclopramide, such as REGLAN tablets, REGLAN ODT. Take Metoclopramide exactly as your doctor tells you. Do not change your dose unless your doctor tells you. If you take too much Metoclopramide, call your doctor or Poison Control Center right away. Do not drink alcohol while taking Metoclopramide. Alcohol may make some effects of Metoclopramide worse, such as feeling sleepy. Abnormal muscle movements. See "What is the most important information I should know about Metoclopramide?" You may still have side effects after stopping Metoclopramide. You may have symptoms from stopping (withdrawal) Metoclopramide such as headaches, and feeling dizzy or nervous. 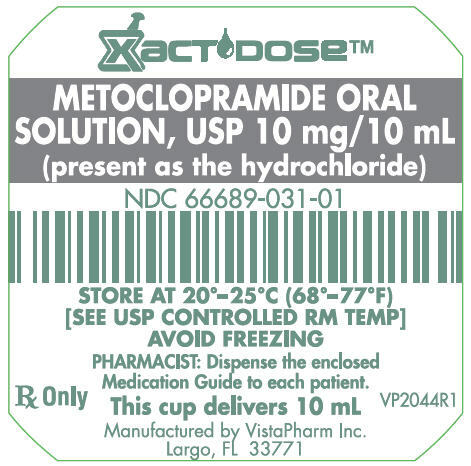 Store Metoclopramide at room temperature, 68°F to 77°F (20°C to 25°C). Keep Metoclopramide in the container it comes in. Keep the container closed tightly. Medicines are sometimes prescribed for purposes other than those listed in a Medication Guide. Do not use Metoclopramide for a condition for which it was not prescribed. Do not give Metoclopramide to other people, even if they have the same symptoms you have. It may harm them. This Medication Guide summarizes the most important information about Metoclopramide. If you would like more information, talk to you doctor. You can ask your doctor or pharmacist for information about Metoclopramide that is written for healthcare professionals. For more information, call 1-877-530-1633. Inactive Ingredients: Anhydrous citric acid, FD&C yellow #6, flavor butterscotch, glycerin, methylparaben, purified water and sorbitol solution.